API Pond AlgaeFix effectively controls many types of algae in your ornamental pond, water garden, or fountain. This safe, effective water treatment removes Green or Green water algae (Chlorella), String or Hair algae (Cladophora) and Blanketweed (Oedogonium). PondCare Algaefix will not harm aquatic pond plants, koi or goldfish. It does not cause cloudiness, alter the pH, or add harmful copper to your backyard pond. Does not expire. Note: Do not use with: Shrimp, Crabs, Lobsters, Crustaceans or Snails. Directions For Use: It is a violation of Federal law to use this product in a manner inconsistent with its labeling. For synthetically lined pond and fountain use only, where all water is contained without any outflow. Once algal growth is under control, add one dose per week. Weekly treatments will control algal growth and reduce pond/fountain maintenance. CAUTION: Do not use with freshwater crustaceans, including shrimp, crabs and lobsters. Caution: Harmful if swallowed or absorbed through the skin. Avoid contact with skin, eyes, or clothing. Wash throroughly with soap and water after handling. NOTE: This product contains a chemcial known to the state of California to cause cancer. First Aid: IF ON SKIN, thoroughly wash with soap and water and remove contaminated clothing. IF IN EYES, hold eye open and gently flush with water for 15 minutes. IF SWALLOWED, call a Poison Control Center or Doctor immediately for treatment advice. Storage And Disposal: Nonrefillable container. Do not reuse or refill this container. Offer for recycling, if available. Rinse thoroughly before disposing of empty container. Do not contaminate water or feed by storage or disposal. For more information, contact the PondCare Technical Services Department at 1-800-847-0659. I ordered the 2.5 gal container of AlgaeFix. I have used this product for 4 years - but this was my first time to order it thru PetMountain. I will buy from them again. This stuff has cleaned up a terrible pond situation. String Algae and every other ugly nasty green gunk you can imagine. I have tried other treatments and have never had as good of results as with this stuff!! 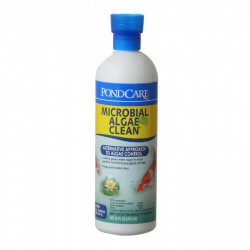 Make your pond beautiful again with this miracle worker!!! Don't pay attention to the reviews that this stuff kills fish. It's hog wash. Clearly it wasn't this product that killed the fish, it was the fish owner. I've used this stuff for years. Need I say more??? We have 2 ponds with a total of 3000 gallons of water and we have used this product for 3 years and we no longer have an algae problem. It works great even for string algae. Purchase was very smooth and simple! Very happy with Pet Mountain's prompt service, delivery and and pricing. I originally ordered this more as a preventative measure for my new 300 gallon fish pond. My husband has a small 50 gallon pond for his bog plants and he was having a terrible time with the string algae this summer. I suggested that he try it in his pond. It cleared up the algae in just a day! He wished that I had ordered it sooner! Very pleased with this product. Does a great job. Glad we found this at such a good price. Love this product. Works very well in our water feature. In fact the man who created our falls/pond is always impressed by how clean it is. Great product! I've been using this for over ten years with great success. You can't beat the price. Retail stores charge twice what I paid at Pet Mountain. Fast delivery as well. I have 2 ponds for a total of 3000 gallons and I have found that Algaefix works the best for controlling algae. I just followed the directions (what a unique idea), started another fountain for aeration, kept the pump running 24/7 (which is normal operation for this small pond), removed the dead, floating algae and the stream & pond is much clearer after first application. I purchased this product locally and it did a good job, but was very expensive for the size pond I had. The small bottle cost $16.99 so I went online and ordered 3 times the amount from you for less, even with shipping. Very good product and a great price, pond was so green you could not see any fish. After 3 weeks of treatment it was crystal clear. Great product and good service, arrived on time. We just bought a house with a fairly large pond with lots of green yuck! And I ordered this product to see how it would clear the unsightly algae. It not only worked but the weekly treatment has kept our pond clear. I don't know if the fish care but they look better! It took 7 applications but the pond went from pea soup to clear; I can see my koi once again as well as the bottom of the pond. Patience is necessary but the product works very well. I bought the gallon size and use it weekly from now on. The best product I have ever found to fight string algae. I have used it for over 2 years now and it never fails me. This product is aggressive and you need to know exactly how much volume of water you have. Calculate how much Algaefix you will need for your total pond volume and then use only 75%. It is better to less concentrate to prevent harming or killing your fish, it will burn their gills if you put to much in. Within days you will see the algae disappear. Excellent. String or Hair Algae had just started in the brook from the top pond to the bottom pond. It was hanging off the four waterfalls. I treated it just once and the algae all died within three days. I will follow up with another treatment today "just to make sure". The fish are fine and the aquatic plants are fine - just as promised on the label. 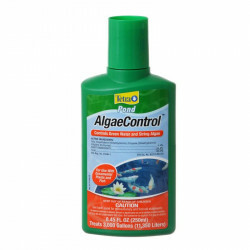 I have been looking for a product to control the algae in my aerated pond and this product cleaned up the pond of string algae and has kept it clean. 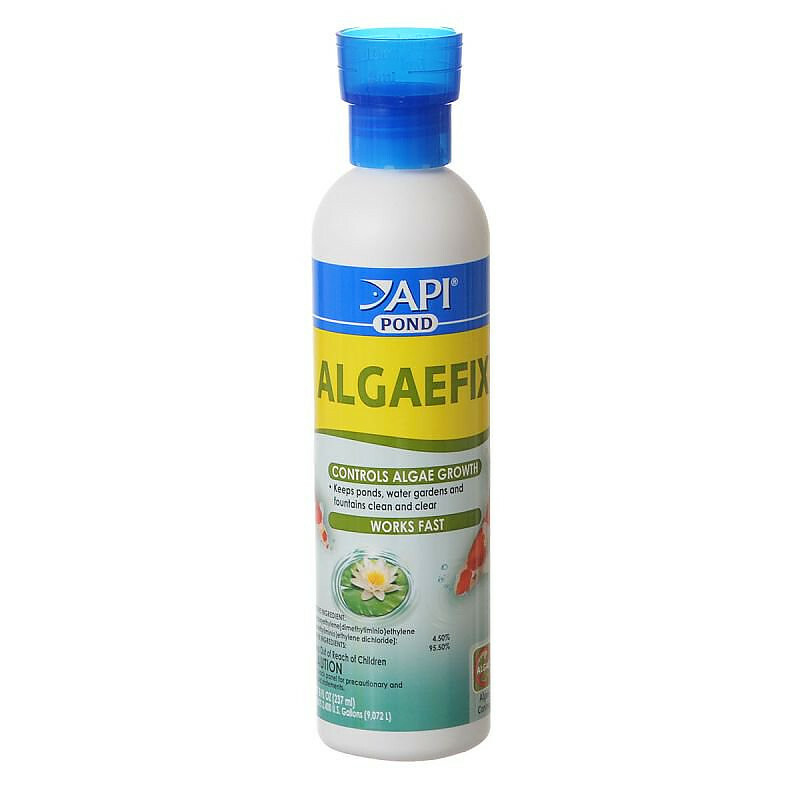 I have only used Algaefix in my pond and this is always the best price. Algae Fix, was recommended by the person that built and maintains our pond. I have tried other products and this is the only one that has satisfied our needs.. My wife comments a lot "how clear the water is ". I highly recommend Algae fix and also Pet Mountain has all other prices beat. If you have a problem with stringy out of control algae, buy this product. Don't waste your time with other products. If algaeFix can eliminate my algae problem, it can eliminate any one's! Our algae problem was so bad, it did take a couple of treatments and about a week for it to clear completely but it took care of the problem without harming our plants or fish. Living in TX, the heat is awful. I have no trees around my pond. This product will keep it algae free and clear. Great product and I highly recommend it. Good to have the best product again! Our local store stopped carrying your product line so I tried some other brands. They didn't work as well. I use the Algaefix, Ecofix and Pondzyme...my pond is looking better already! I've been using this product for 10+ years on a 2000 gallon pond. Product works well without being cost prohibitive. Pet Mountain was fast, courteous, and accurate; all that I look for in an online company. Would not hesitate to call them again. Reliable results and its availability in gallon size make this our go-to product for reducing and controlling algae in our 7000-gallon koi pond. This product used on a regular schedule (along with a UV light and followed by Accu-Clear Pond Clarifier) keeps our pond water clear to the bottom. If you're a new pond owner, this is the product you want! Just remember to keep water constantly agitated by a waterfall or other strong aerating device for at least 24 hours during use. Algaefix is an excellent tool to control algae in my KOI pond. It definitely reduces pond maintenance such as cleaning pond filters. Petmountain is an excellent place to get the product. Shipping went well without any problems. For 3 years we have been trying to clear our pond of algae, and this product is great, our fish don't need a seeing eye dog any longer. The water in the pond even with the clean filter and UV clarifier was still a little murky especially after the lawn was cut and dust flew in, and this pond care, just a couple of cap fulls did the trick! All clear. We ordered the PondCare AlgaeFix for our water feature. It was the cheapest from this site and came in a timely manner! So far, it seems to be working much better than other products we have tried (and we've tried many). My daughter also is using it on her water feature and she has both fish and plants, both of which are doing fine with it. We recently had our pond re-done completely. It turned out great and we were real happy with it. It was so nice to be able to see clear water and to be able to see the fish (the water in the old pond was always very dirty since we bought the house 3 years ago, even after draining and re-filling it). But after a month or so, the water became green. I used a powdered product that we bought from the company that installed the new pond, but it didn't do anything. So I searched the internet and found AlgaeFix. I was somewhat skeptical about reviews, but I decided to order it. When the product arrived, I put some in the pond around 6 PM. When I checked the pond in the morning it was completely clear. That was about 6 weeks ago, and it's been clear ever since. I add a little once a week for maintenance. MY ALGAE IS GOING AWAY!!!!!!! 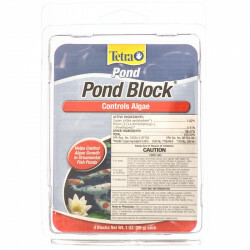 This seems to be much better at controlling the algae in my pond than any other product I have found. Best Product on the market for Algae Control! PondCare AgaeFix is the Best Product on the market for Algae Control in a fish pond. I have tried all kinds of other products and none work like this does. This is my second year using it. I Have others I bought that are just sitting on the shelf. Great Product! We have been fighting algae since spring and nothing I used made any difference until I sent off for AlgaeFix. Within a day of using this our pond went from green out of control to clear. We couldn't even see our fish. I love this and would recommend it for troubled koi ponds. Great price and delivery schedule! Perfect! Thanks! Pond Care Algae Fix works great in our little pond and helps control our algae problem! I've tried several products with limited success at a cost I think far surpasses the real value. I have had a major algae problem in my 5000 gal Koi pond since I foolishly introduced some local wild plants. AlgaeFix is the best product I've used so far in keeping all forms of algae at bay and I will probably continue to purchase it. AlgaeFix is the best I have found. I live in South Carolina, and my pond is in full sun, and as long as I keep up the weekly dose, I have no algae. I am back again to replenish my supply!! AlgaeFix is the only thing that keeps my pond clear. I've tried so many other products both natural and chemical and nothing beats AlgaeFix! This product has the best pricing here compared to everywhere else on the internet that I've looked. From it's description it will do exactly what my previous product (Green Clean) does, but costs $70 less!!! Great Job! I have a large Koi pond, about 60 fish, and live in southwest Florida...need I say more about how much I need an algae control product that works? Have used and reordered this product for two years now and it is the only thing that keeps the pond clean. It works better in the winter months of course but we make it through the hot summer by using more often. I recommend it for keeping the green slime at bay. This stuff really works, but you have to use as directed. As soon as I ran out of it, my string algae problem returned. THIS STUFF WORKS GREAT.MY POND GET MORE SUN THEN IT SHOULD. THIS STUFF KEEPS THE ALGAE AT BAY ALL SUMMER LONG. Algaefix is great for our 100 gallon pond, easy to use, does not kill plants, and keeps our water very clear. Worked on my neighbors pond! My neighbor recommended this product and his pond is so clean compared to mine. I have tried other products, but none of them made my pond look like my neighbors. My husband really loves Algaefix for our pond. I live in Las Vegas and with the heat we get, it creates a lot of algae in my pond. I have used Algaefix and it works great! Fantastic pricing on this site! Thank you! Ordering to make sure I have enough for all summer. My pond can't be without it. Great product! This product is amazing. I have had my pond for 4 years and it is in direct sun. AlgaeFix is the only product that keeps my algae under control. Highly recommend it. Could not have a pond without it. I could not have a pond without it. My pond gets sunlight almost the whole day. Algae had my pond green all the time. If I cleaned it and changed the water it was only two days to be back the same green water. This stuff has taken care of it. I use once a week and I no longer have to worry about it. I've used Algaefix for years and it works great keeping string algae under control. I buy it from Petmountain because of their great price and customer service. Would highly recommend Algaefix to any pond owner concerned with string algae. The only product that works!!! My pond receives a lot of sun here in central florida. With using AlgaeFix is the only chemical treatment that helps me beat the algae. Ordered it before and i'm back ordering more. Living in the north country we came out of the winter with a noticeable amount of string algae. Who would have thought that algae grows so well in the frozen winter months. Applied the subscribed amount of AlgaeFix and the string algae cleared up within a week. Fish and plants were not affected. AlgaeFix has been on our pond care shelf since. I use this product regularly to keep my pond water clear. It eliminates algae in only a few applications. Use regularly to keep your pond clear. It's so nice to be able to see the fish! With two ponds, we can deal with quite a bit of algae, and we have tried many things but AlgaeFix works better than anything we have tried. We have ten fish in one pond and 22 in the other as well as plants and snails. AlgaeFix has proven to be very safe as we have never had a problem. I would recommend this product to anyone. Stops and clears algae in days and keeps working with occasional use. I found Algae Fix for my Koi pond at a super low price at petmountain.com. Algae Fix clears up my water and eliminates string algae buildup. The order taker said the product would ship out that day and expect to see the item within three business days. UPS showed up the very next day!!! Great price, great service, fast delivery. I'll use Pet Mountain again. Thank you!! this is the best algea control i have tried. my water was green. I did half a water change and used algea fix and it cleared up in two days. Algaefix did exactly what I wanted.. kill my string algae with out harming my fish. By purchasing online I can save nearly half the price that my local pond store charges! I've used Algaefix for years with great results. Incredible product....cleared up the algae bloom I had in the pond within a day. Also helped to remove the algae growing on the rocks under my fountain. Algaefix helps keeping my pond algae free. I love it! I had a problem with Algae until I called the company technical support for help. I am using Algaefix as per their recommendation and it works very well. Now the problem with Algae is under control and the pond looks clean. Thank you Aquarium Pharmaceuticals. THIS PRODUCT WORKS WONDERS. WE HAVE A 9,000 GALLON POND, STRING ALGAE OVERTAKES THE UPPER PONDS, WATER FALLS AND STREAM. ALGAEFIX KILLS THE ALGAE BUT DOES NOT HARM OUR FISH OR OTHER PLANT LIFE. IT IS FAST ACTING AND SAVES HOURS OF WORK KEEPING THE WATER CLEAN AND CLEAR. I created 4 ponds of various sizes in our backyard. Each has a waterfall & a stream connecting the top pond to the lower. I recycle the water at a rate of 3200 gals/hour and have a couple of fountains to assist in aeration. Algae plagued me until I discovered Algaefix. I use 64 oz/treatment about every 3-4 weeks and it keeps the pond clean. This is a wonderful product! Last summer my pond developed an awful case of string algae. Even though it had a pretty good grip on the pond, Algae Fix completely fixed the problem. I wouldn't do without it now. Also, the price, counting the shipping, is much better than my local pond shop. We won't use anything else. It was recommended by the company that installed our pond. It makes the pond really clear and it works quickly. The Algae Fix worked wonders with my pond. I can count on this product to clear up any algae problems. My fish are also healthier!